February ended here in Minnesota with a blizzard of over a foot of snow and I am ready for spring. As we move into March, the end of winter is in sight ... Yay! Fancy jasper (or Indian agate) is one of my favorites. 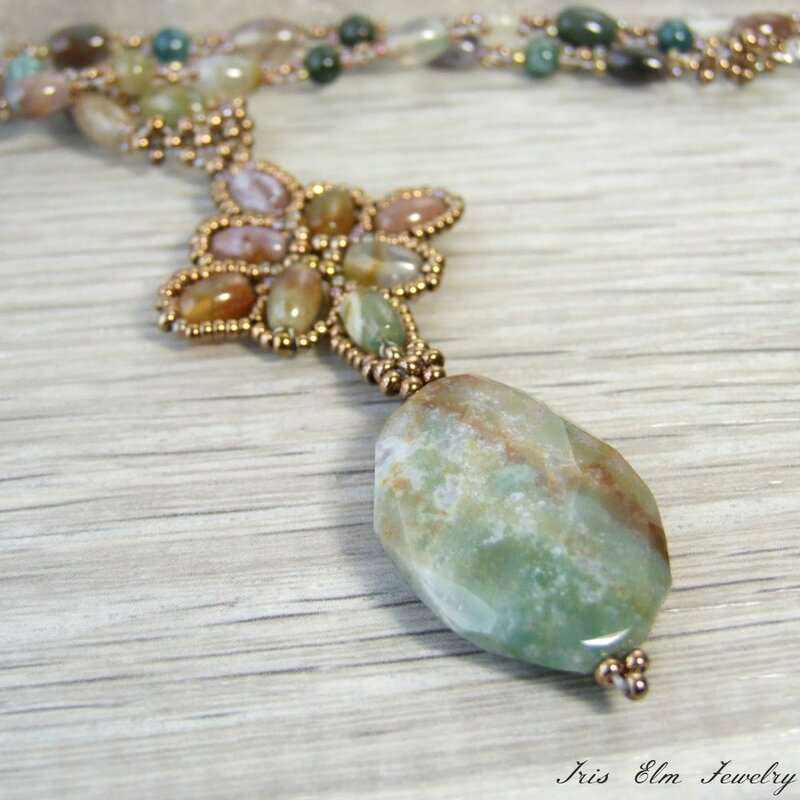 I love the multi colors of the different stones and how the earth-tones all go so well together. This pendant is inspired from my quilted earrings design, though I used different colored seed beads then the earring version (found here). 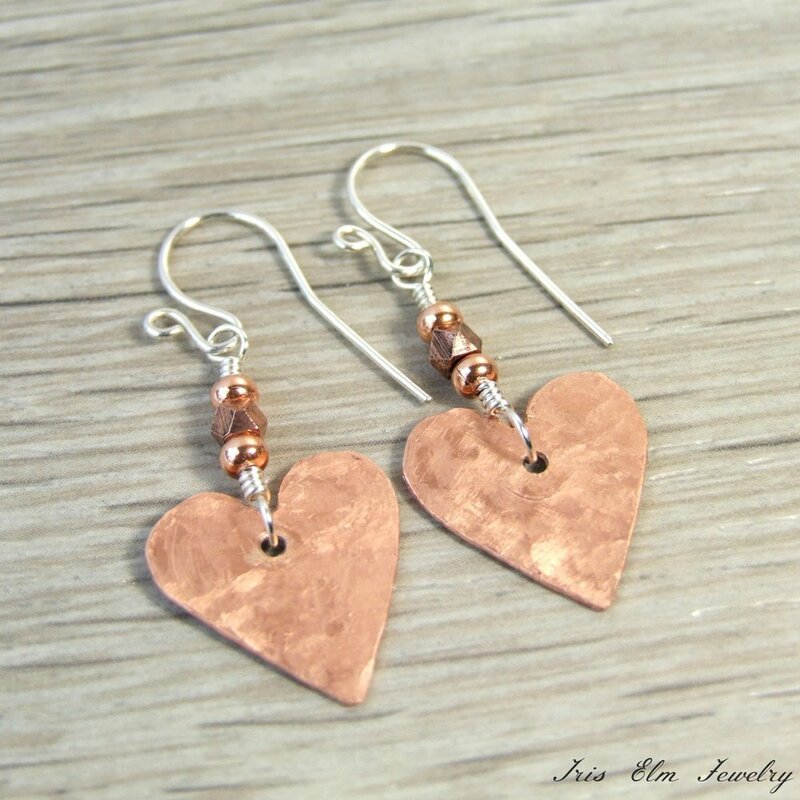 Small copper hearts are hand-cut from copper sheet metal for these sweet and simple heart dangle earrings. I combined the copper with sterling silver wire for a mixed metal look. Going with the mountain of snow in February theme, I designed this snowflake bracelet to match my White & Silver Snowflake Earrings. This bracelet was very intricate and took hours of beadweaving to make. I already had the snowflake design of the earrings, so I made this bracelet up as I went, with quite a few false starts before I got it to look the way wanted to, as usually happens when designing something new. Larvikite is an interesting stone that comes from Norway and is similar to labradorite with its shimmering iridescence. The dark grey neutral coloring stone makes these earrings a complementary accessory for any occasion. I am getting more and more into metalwork jewelry and am still new to it so I am slowly learning some new techniques. For these earrings I cut brass sheet metal into triangles then hammered. I then wire-wrapped a pretty mint green and gold vintage-looking Czech glass bead to go above. 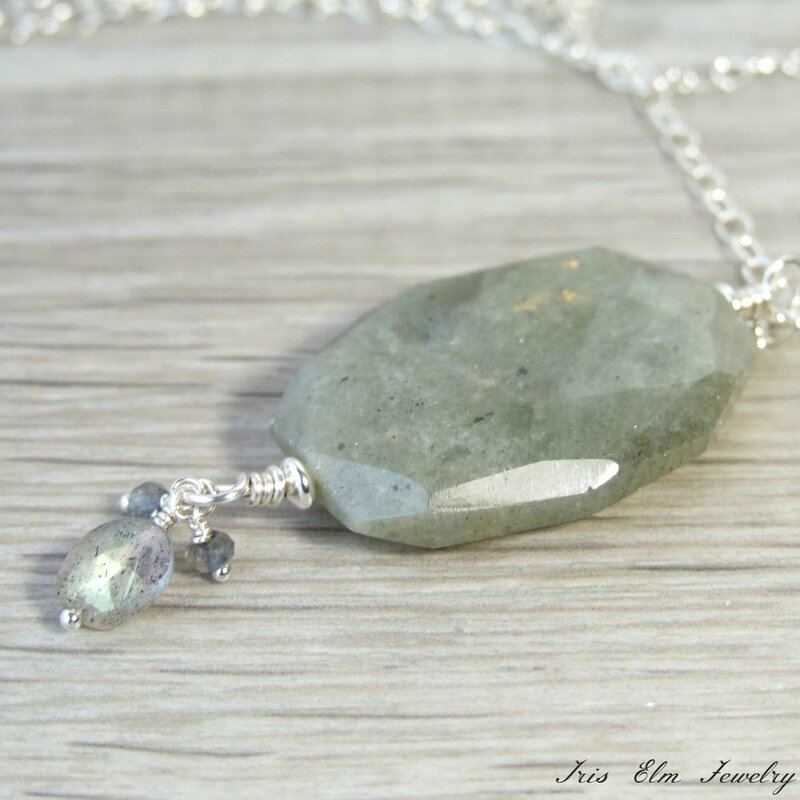 For a pretty bohemian look, I made this sterling silver necklace with a flat faceted iridescent labradorite nugget then wire-wrapped a trio of small labradorite gems beneath. This necklace can be dressed up or dressed down.